ONEbit hosting Review 2019: Is ONEbit hosting a Good Hosting? ONEbit hosting is a Czech based website hosting provider. They offer an array of award-winning services along with top notch customer service. 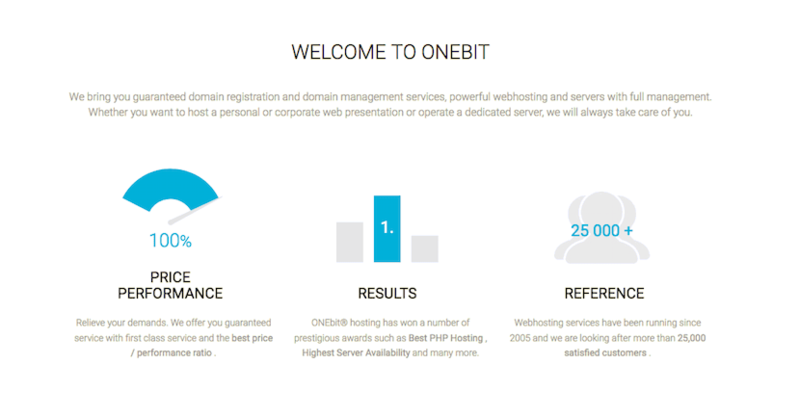 Founded in 2005, ONEbit hosting is a website hosting provider in the Czech Republic. They currently have over 25,000 customers and have won many industry awards including Top Speed and Highest Availability. Their customers are mostly located in the Czech Republic, with others in Slovakia, Austria, India, and Turkey. The first notable feature of their plans is their commitment to “flexible” disk space. They state this is different from “unlimited” disk space as they will not limit you to the amount of space you can use. However, the amount of disk space is limited by their fair use terms and conditions. While it sounds very similar to most companies’ use of the word unlimited, the only difference is they do commit to a minimum amount of bandwidth guaranteed. In all fairness, they are very transparent about the terms and include both a useful tool tip and information in their terms and conditions. Their servers are collocated in two data centers in the Czech Republic. While I was advised by their customer service that they do not use the tier categorizations of their data centers, their data centers do have full redundancy and 99.99% availability. Their servers use RAID SSD storage, multi-core Intel® Xeon® processors, and certified memory modules, all with 24/7 monitoring and security. They also provide a lot of security features as standard with their plans, for example, anti-DDos protection, anti-malware protection, and IPDefender to provide support against virus attacks. It’s also great to see that they support PHP 7, and they’ll install an earlier version, if required, upon request. Their monthly price point is relatively close to large global competitors. They are definitely not a budget provider, however their price is inline with what you would expect to pay with a large company. What’s different is that their price remains the same and does not increase after an initial discount. Their prices are listed in monthly terms but when I checked out, the only option was to purchase and pay for one year upfront. It was not very clear how to change the contract length, despite the fact they advertise up to 25% discount for longer term contracts. What is remarkable about ONEbit hosting is their two-month free trial. New customers are invited to try their services for up to two months at no cost. This is a great added value for new website owners and experts alike. If that’s not enough, they also offer a no questions asked money-back guarantee. The only downside is, I did find it quite confusing to pay and check out. It wasn’t clear at what point I would be charged and for how long a payment term I was signing up for. Their customer service includes telephone, email, Facebook, and Twitter, and they do not clearly advertise their business hours or their average response time. That said, they do have a service status page on their website, along with a detailed help center. I’ve always contacted them via their Facebook page and I’ve found them to be very helpful. They have always answered within a few hours and been polite and well-informed. ONEbit hosting is a professional company with thousands of customers, many positive reviews, and a series of awards for their performance. Their packages are affordable and their service is top notch. Wondering how ONEbit hosting stacks up against other Web Hosting companies? Enter any other Web Hosting company and we will give you a side-by-side comparison.